Typically the May Long weekend for me growing up meant a softball tournament. Sometimes with snow. As a grown up, I associate May Long with getting the garden in and the flowers in. This year was a little different- we shook things up and spent a gloriously sunny weekend over in Calgary for a basketball tournament. 1- the family time in the car for the 6.5 hour LONGASS drive to Calgary. The kids alternated between reading books, playing games and watching movies while I did my cyber, blogged, sang songs and listened to Dan. 2- family time in Calgary. My parents and sister and her family all ended up in Calgary too, visiting my brother so we had the entire gang out for suppers and to watch Will play basketball. I love seeing the support for our kids. The love is felt. 3- Time with my bestie and her family, where we stayed. It's great having our kids together and get to be in their space for way more time than if we just would have gone out for supper. Plus she made me mojitos and made me watch the Royal wedding. 4- Shopping time with Christy and a surprise guest, Jordan. I bought a denim mini skirt and am quite proud of myself. 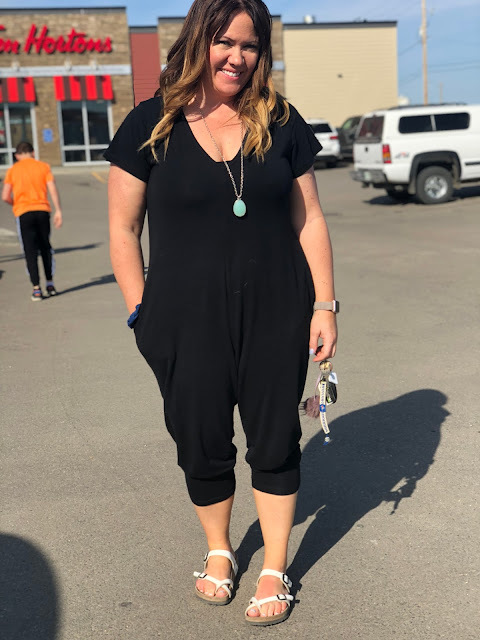 In other fashion fun news, I wore my Smash and Tess Romper out in public....I didn't get any compliments on it and my kids kept asking why I was wearing my pajamas but I was cozy AF for travel day and two bball games so I was quite happy with myself. 5- The weather. I feel like we have officially skipped spring and are headed straight into the glorious days of summer- the drive home, while long, was actually quite beautiful with the sun and the big open blue skies. That was my long weekend- I'm looking forward to having the day tomorrow to catch up on some yard work! Linking up with the girls on the Blended Blog. Family, friends, food, fashion, and fun are all the ingredients for a fabulous long weekend! I love the romper btw - looks so comfy and cute! I happen to adore your romper! Yay for a reunion with Christy...and mojitos!! Fun weekend - awesome to see all the family support! Can't be family (and friend) fun on a long weekend! That sounds wonderful. I'm so happy you finally have sunshine and no snow! Yay for family time and support and feeling the love! I think the key to the romper may be adding the necklace. No one wears a necklace with PJs. I will try that next time. I loved following your IG stories last weekend. HI Christy! I would have totally complimented you on your romper if I'd run into you.